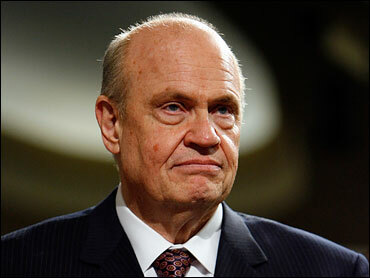 Fred Thompson still hasn't officially entered the race for the Republican presidential nomination, but he's already a strong contender. Thompson, the "Law & Order" actor and former Tennessee senator, is tied with Arizona Sen. John McCain for second place, behind former New York Mayor Rudy Giuliani, in the latest CBS News poll. With Thompson in the mix, Giuliani leads among Republican primary voters with 34 percent. He's followed by Thompson and McCain, at 22 percent and 21 percent, respectively; and former Massachusetts Gov. Mitt Romney at 6 percent. Without Thompson in the field, Giuliani jumps up to 42 percent, trailed by McCain at 26 percent and Romney at 8 percent. IF THESE WERE THE CANDIDATES, WHO WOULD YOU WANT AS REPUBLICAN NOMINEE? On the Democratic side, New York Sen. Hillary Clinton maintains her lead in a three-way race over Illinois Sen. Barack Obama and former North Carolina Sen. John Edwards. As in previous polls, Democratic voters are more satisfied with their party's candidates than Republicans are. IF THESE WERE THE CANDIDATES, WHO WOULD YOU WANT AS DEMOCRATIC NOMINEE? Only 30 percent of Republicans say they're satisfied with their choices — the lowest number ever. Sixty-one percent of GOP primary voters want more choices. Conversely, 61 percent of Democrats are satisfied with their candidates, while just 35 percent want more choices. A majority of Americans, 53 percent, would like a third party to compete with Democrats and Republicans; 41 percent disagree. But as of now, most don't know much about New York City Mayor Michael Bloomberg, whose recent decision to drop out of the Republican Party fueled speculation that he's considering an independent run for the White House.